The definition of a based freestyle is simple: spitting bars in a stream-of-consciousness manner that can tell a story or simply express the emcee’s emotions. 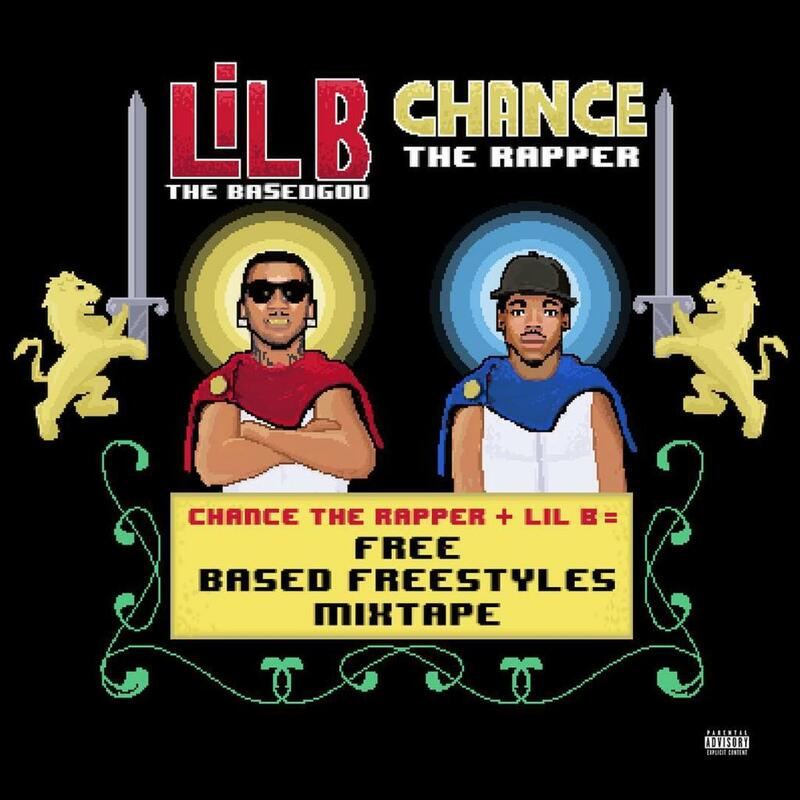 On Free (BASED FREESTYLE MIXTAPE), a collaboration between based-originator Lil B and rising superstar Chance The Rapper, each rapper opts for one of the aforementioned takes on based freestyles and runs with it for the EP’s half an hour of hip-hop at its most eclectic. Moving from Internet forums in 2009 to ESPN in 2015 since the first based freestyles made their way on MySpace provides an obvious change in context for the Based God’s side of the project, yet on Free, this notion could not be any less apparent. Flowing like it’s 2009 all over again (nasally voice and all), Lil B hasn’t seemed this comfortable in the booth in years. Whether it’s spitting bits of anecdotal wisdom (“Starting to look at ‘em like history/We livin’, but in misery”) or sounding like he just ingested research chemicals (“I’m like a watermelon because I just spit out the seeds, but sometimes they can’t see me”), his verses are absurdly entertaining. As for Chance The Rapper, Free finds him at the absolute peak of weirdness. Embracing the wittier half of the freestyle approach, Chance’s lines feel like a hyperactive abstract painter becoming vocalized as he twists and turns through various thoughts with a range of approaches somewhere between rapping, singing, and a slam poet-esque center. His flow leads to an endless amount of quotable segments (“I had to dissolve ‘em/Like acid to bases/They want me to go back to Acid, the basic”) that display complete lack of a barrier between Chance’s complex thought processes and his verses. When combining these two aforementioned styles, each rapper proceeds to ride the beat for minutes at a time on songs pushing a ten-minute runtime. It rightfully sounds overwhelming, but when Based God and Chance’s styles collide atop wonderfully produced beats ranging from soulful to sounding like The Postal Service flipped, it’s a journey where time simply ceases to exist amidst the ebb and flow between visual wordplay and cerebral thought-exposés. On ‘First Mixtape,’ Chance hops off the beat to let listeners know, “While you sparking that blunt to this based tape, I want you to understand; we love you, for real.” His statement precisely sums up the atmosphere of 2015’s most surprising project; something that was made not for the artists’ desires, but for everyday people to interact with, embrace, and enjoy how they see fit. Whether it’s used as background noise for a get-together or listened to on headphones with precision, Lil B’s absurdist bars and Chance’s ascent into musical nirvana readily offer the listener a sense of joy and inclusion that not many records can proclaim to comprise.